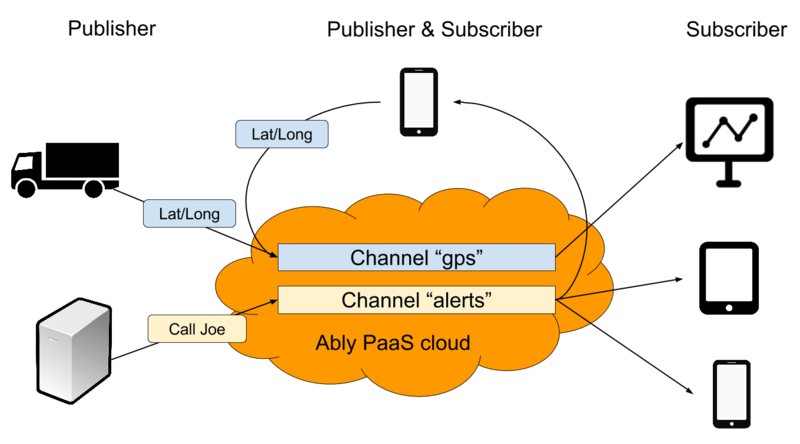 Ably’s global realtime service enables Internet enabled devices, such as a browser, phone, server or IoT sensor, to stream data in realtime between to any other Internet connected device in milliseconds. 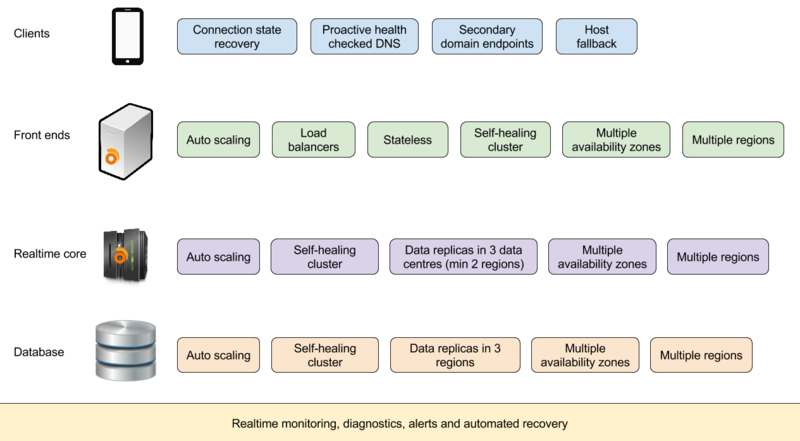 The Ably platform brings enterprise scale messaging to developers by delivering 100% service availability, message delivery guarantees- and low-latencies globally (typically less than 60ms). 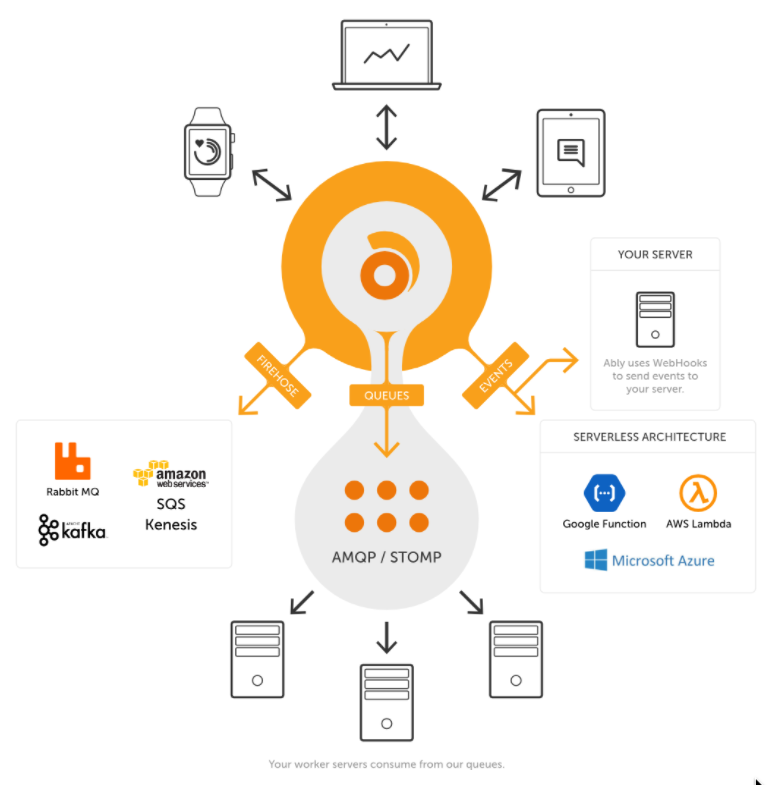 At its core, Ably is a cloud-based pub/sub Platform-as-a-Service ensuring any device publishing messages to Ably will be received in real time by any number of subscribing devices. But it is more than that. Ably makes it possible for developers to build apps and infrastructure that can communicate in realtime without the worries of managing scale, latency, data durability, integrity and storage, seamless connection recovery, device interopability, network outages, encryption, security and authentication, throttling, and denial of service attacks, to name a few. Additionally, our platform supports both pub/sub and message-queue patterns. In order to understand how Ably works, and why pub/sub is only one part of the problem we solve for developers, we have have broken down the key concepts below. The Ably service organizes the traffic within any application into named channels. Clients connected to Ably can either be publishers (they push messages with data to Ably), subscribers (they wait for messages to be pushed from Ably to them), or both. Messages are always published over a named channel. Channels are used to filter messages, so whilst billions of messages may be delivered by Ably, subscribers will only receive the messages on the channels they subscribe to. Channels are uniquely identified by a string specified when publishing to or attaching to a channel. Publishers and subscribers are completely decoupled: a publisher can publish a message without any subscribers on the channel; subscribers can listen on channels that don’t yet have publishers; arbitrarily many subscribers can receive a single message published on a channel. In other words, Ably channels support one-to-many (fan-out), many-to-one (fan-in), and many-to-many. The following diagram illustrates a very simple use case for channels. The server and vehicle are publishing messages on channels without any knowledge of subscribers. One mobile device is both a subscriber and publisher and is publishing its location, but also subscribing for alerts. All other devices are subscribed to just one channel. Whilst Ably is used primarily by clients to receive messages in real time, Ably provides a history API that allows clients to retrieve older messages from memory and/or disk. Presence provides awareness of other clients that are connected to Ably and present on a channel. Each member present on a channel has a unique client identifier and an optional payload that can be used to describe the member’s status or attributes. Presence allows you to quickly build apps such as chat rooms or multiplayer games as Ably will automatically keep track of who is present in real time across any device. Clients can also subscribe to the presence events and members on a channel without being present themselves. There are three presence operations, enter for new members, update allowing the payload data associated with a member to be updated and announced to everyone, and leave for members that have requested to leave or who have left implicitly as a result of their connection being disconnected. Whilst pub/sub channels are well suited to fan-out, fan-in or one-to-one communication between servers and/or devices, they are less well suited to servers that want to consume realtime data and distribute that workload between server nodes. Consuming realtime data in a scalable, reliable and stateless way requires a different strategy, and our Ably Reactor services deliver that through streams and message queues. The Ably Reactor Service is powered by a rules engine that enables realtime data to be streamed into our Ably Reactor Message Queue service or any third party queue, streaming provider or endpoint. Ably supports two forms of authentication described below. For an in-depth explanation, view the authentication documentation. Basic authentication is the simplest form of authentication, allowing clients to communicate with Ably by including the complete private API key within the URL or request headers. To mitigate the risks of sending a private key over the Internet, basic authentication is only permitted over an encrypted TLS connection. Private API keys and their capabilities (permissions) are managed within an app’s dashboard. In most cases, we do not recommend that basic authentication is used as it requires that you share your private API key with the client that is connecting to Ably. Our recommendation is to only use basic authentication on your trusted servers. Token authentication provides a means for clients to connect to Ably without a private API key. Tokens have a time-to-live (they expire) ensuring that any compromise of a token will have a limited impact. Token authentication is also used to identify clients and provide fine-grained access control on a per-client basis. 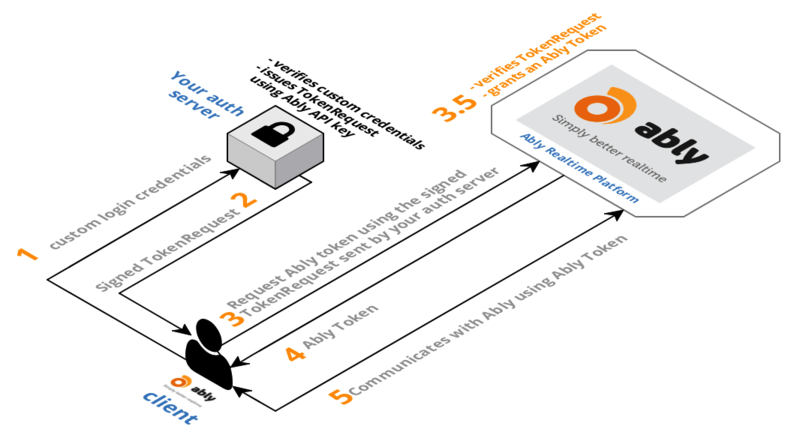 Most often, token authentication is implemented as follows: an Ably TokenRequest is generated by your server; it is signed using your private API key and then passed to the client; the realtime client uses this Ably TokenRequest to request an Ably Token from Ably directly. This approach is recommended as at no point does your server need to communicate directly with Ably and ever communicate the secret API key. An equally viable method is to generate a JSON Web Token (JWT) on your server; it is signed using your private API key and then passed to the client; the realtime client uses this JWT to authenticate with Ably. A JWT which has been constructed to be compatible with Ably is known as an Ably JWT. Any third party software can be used to generate this JWT using the Ably private API key to sign it. A client using token authentication is considered to either anonymous, or identified if a client ID exists in the token. All messages, presence state and connection state for identified clients contain the trusted client ID and are accessible by other clients. As a private key is needed to generate a token for a client with a client ID, the client ID can be trusted by other clients. Find out more on identified clients. Tokens are limited to the capabilities of the API key used to create the token. The capabilities of a token may be limited further using fine-grained permissions using a combination of the operation (such as publish, subscribe, presence) and the channel(s). Find out more on token capabilities. 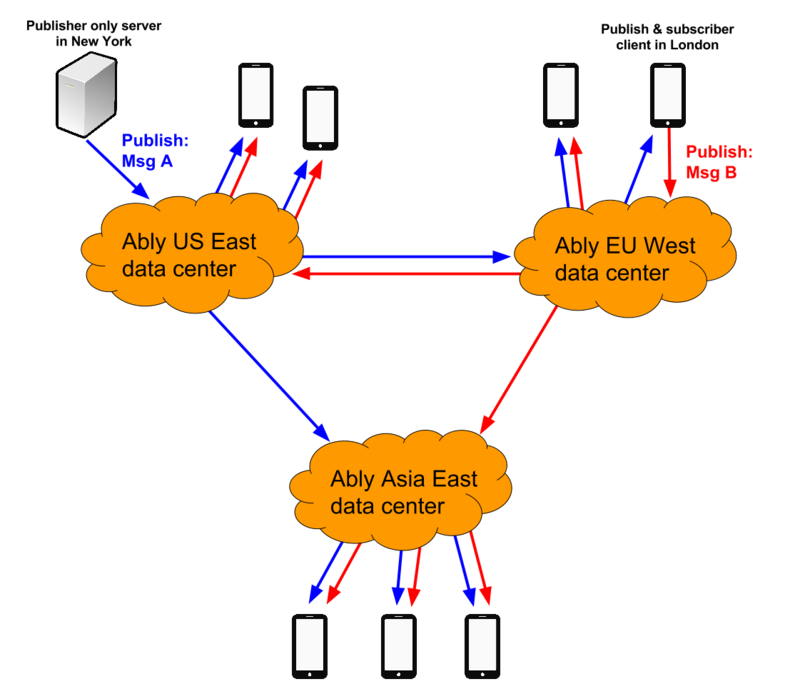 The Ably service, running in over 14 data-centers globally, provides a true mesh distributed system ensuring that there is both no single point of congestion and no single point of failure. Ably is designed to always route messages using the least number of network hops minimizing latency and ensuring maximum performance for clients no matter their location. It is common for devices to have constantly changing network conditions as a result of moving from a mobile data network to a wifi network, being in a tunnel for a short period, or perhaps due to intermittent network issues. We believe that developers shouldn’t have to worry about service continuity between brief connection loss. As such, Ably ensures that the connection state for a client is retained on our servers whenever a client is disconnected abruptly. By retaining a client’s connection state on our servers, this allows us to replay all channel activity back to a client as soon as it reconnects. By default all of our client libraries use TLS when communicating with Ably over REST or via our Realtime transports such as WebSockets. We do not charge customers for using TLS and actively encourage everyone to always use TLS as it provides a secure transport for communication with Ably with very little practical overhead. Whilst TLS encryption ensures that messages in transit to and from Ably cannot be intercepted, inspected, or tampered with, it does not ensure that the Ably service itself is unable to (in theory) inspect your messages and their content. If you want to ensure that all messages are encrypted and complete opaque and inaccessible to the Ably service, we provide built-in private key symmetric encryption within our client libraries. 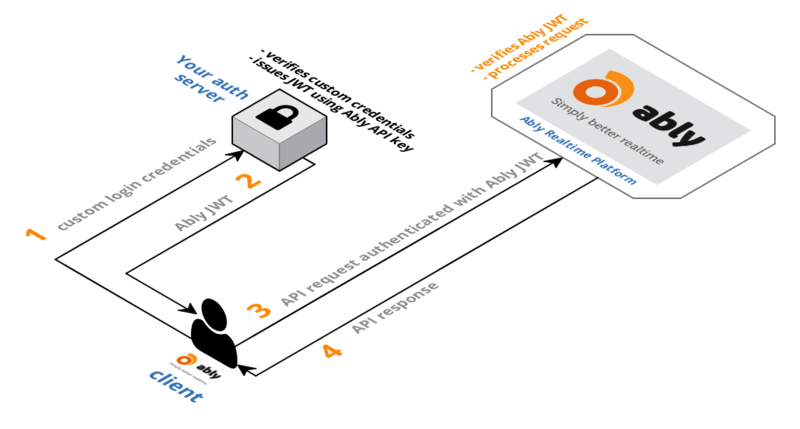 Most of our client libraries use a WebSocket to establish a realtime connection to Ably, and use a simple HTTP request for all other REST operations including authentication.